Synthetic peptide conjugated to KLH derived from within residues 250 - 350 of Human UBR1. Our Abpromise guarantee covers the use of ab42420 in the following tested applications. WB Use a concentration of 1 µg/ml. 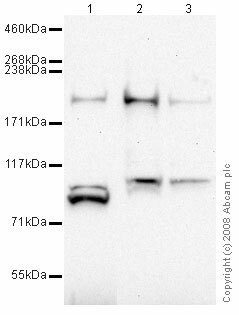 Detects a band of approximately 200 kDa (predicted molecular weight: 200 kDa). Publishing research using ab42420? Please let us know so that we can cite the reference in this datasheet. There are currently no Customer reviews or Questions for ab42420.